In 2018, Cedar Rapids went a combined 77-62 and went to the playoffs. What does the 2019 season have in store. First-year manager Brian Dinkelman takes over the helm and has a solid mix of high-end, young prospects and guys in their first full season, coming out of the college ranks. Today we look at the Cedar Rapids Kernels players and coaching staff. We’ll try to project (or guess) a solid everyday lineup, and discuss the top prospects. Feel free to share any thoughts you may have on the team or roster, and ask as many questions as you would like. After several years as hitting coach of the Kernels, former Twins infielder Brian Dinkelman embarks upon his first season as the team’s manager. He will be replaced as hitting coach by two guys. Another former Twins infielder, Luis Rodriguez, moves up from the GCL this year. And Ryan Smith comes to the organization this year from the College of Central Florida (Ocala). Former big-leaguer Virgil Vasquez will be the pitching coach for the Kernels for the first time. He has been in the organization since retiring after the 2014 season. Here is a look at the Kernels Opening Day roster. Note that this is a tentative roster and can be updated before their season starts on Thursday. 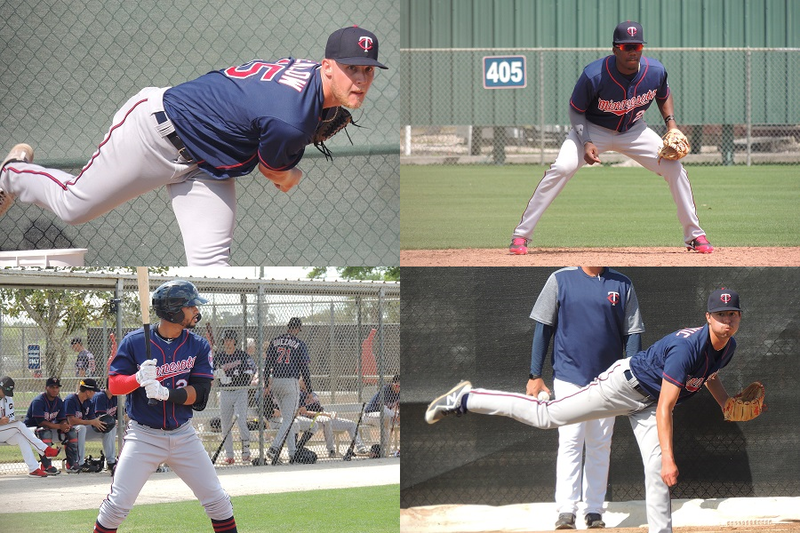 RF - DaShawn Keirsey, Jr.
Blayne Enlow (Twins Daily #9 Prospect) - Enlow was the team’s third-round pick in 2017. He spent 2018 in Cedar Rapids where he pitched well (3.26 ERA) and was limited to 94 innings. His fastball was in the 91-93 range last year and he flashed the curveball that intrigued teams out of high school. Yunior Severino (Twins Daily #15 Prospect) - Acquired after MLB ruled him a free agent after Atlanta got in trouble for their international practices. He joined the Twins and played well in Elizabethton last year. He’s got good pop from both sides of the plate. Gilberto Celestino (Twins Daily #16 Prospect) - Came to the Twins from Houston in the Ryan Pressly trade, Celestino is a plus defensive centerfielder. He’s also got a strong right-handed swing that should develop some power. Jordan Balazovic - Long and lanky right-hander got stronger in 2018 as things really came together for him. Drafted out of Canada as a raw talent with pitchability, Balazovic has added strength and now throws into the mid-90s. DeShawn Keirsey, Jr. - Twins fourth-round pick in 2018 out of Utah. Good speed and defense, Keirsey should also be a top-of-the-order type of hitter. Very athletic and a good approach at the plate. Luis Rijo - Rijo came to the Twins from the Yankees (with Tyler Austin) in the Lance Lynn trade in July. He joined the E-Twins after the trade and went 2-0 with a 1.27 ERA over five starts. Josh Winder - The Twins seventh-round pick a year ago out of the Virginia Military Institute (VMI), he went 3-1 with a 3.96 ERA over nine starts and struck out more than a batter per inning. Cole Sands - The Twins fifth-round pick a year ago out of Florida State will make his professional debut when he makes his season debut. Wander Javier, the Twins Daily #5 Prospect, is being kept back in Ft. Myers for a little while. I assume that they are deciding not to put him at risk in the cold early in the season. He should be up in Iowa very soon. No one questions the immense talent possessed by Javier. The only problem has been his ability to stay on the field. Power, speed and the ability to play shortstop well. There are a lot of good players, including some pitchers who did very well in Elizabethton a year ago, who are starting this season in extended spring training. Many of them will make their way to the Kernels due to injury or poor play or a few other possible reasons. Please feel free to discuss this roster. Ask lots of questions and check back often. What stories will you be following? This should be a pretty decent pitching staff. I am also interested in Yunior Severino.He has the distinction of being a highly sought after / highly paid prospect by not one but two teams.It will be intriguing to see if the "fuss" was warranted. And it will be nice to track if Jordan Balazovic can develop. Trey Cabbage and Jean Carlos Arias are a couple of names I expected to see much further along by now. This appears to be the fifth year in the system for both although there are many older on the roster. I assume the coaches see a future for them or they wouldn't still be here. Hopefully better instruction will be bring out the talent. Heading down May 3-5 ... I hope Wander Javier is unleashed by then. On my list I had Leach likely starting and Villalobos as a catcher but I guess the Twins must think they are not quite ready or have things to work on. I also had Enlow and Balazovic in high A.Enlow wasn't lights out in A ball last year so I can see that it makes sense to give him more time but Jordon dominated so not sure why the need to keep him down there.Do they see something they didn't like this spring? All in all It's a nice group of guys.Will be a fun team to watch again this year. Will be exciting to see if Balazovic and Enlow can dominate this level after getting their feet wet last fall. It is possible that either or both of Enlow and Balazovic are ready for high A. Sometimes if you want to keep a starter starting, you might have to keep them back a level or even push them ahead of the ideal level. It is a pretty group of starters at Fort Myers. Since these 2 are pretty young, it was probably the best option to have begin the year at low A. Years back, the best arms were kept as starters long as possible. Mostly to get them more innings and a better chance to develop secondary pitches, even if it was thought the guy's future was the bullpen. Development seems a little different now, but i think they still like to keep guys with mlb starter potential, starting. Even maybe when you can't put him at his ideal level. Severino will be one to watch. As you pointed out, he got two seven-figure signing bonuses before he turned 19. He's very much talented, and he plays with a lot of flair and confidence. It will be interesting to see how he pans out. Already pretty much moved to second base, but he'll probably hit. Balazovic really took a big step forward in 2018 on and off the field. He's very smart, and he listens well. I'm sure he's a little disappointed to start in CR, but it makes sense. It'll be his first Opening Day with an affiliate. But he certainly is a guy who could move up fairly quickly. Arias spent about 3 months in CR last year but ended the season in E-Town. I think he's talented... and of course, his first year as a pro was in the DSL, so it's not apples to apples. And, he spent two seasons in the GCL, which is also not unusual. Built similarly to Celestino, and a good outfielder, good speed. He should have some rope too. I'll be surprised if he isn't there by then. Leach is listed on the DL in the spring training work groups. I saw a couple of his bullpens and he looked good, threw hard, looked strong. As for Balazovic, he only pitched in 12 games (60ish innings) for Cedar Rapids last year, didn't get up there until June and ended the year early. Nothing wrong with giving him 6-12 more starts at the level. He's young and has plenty to work on yet. Also, very important to remember that teams simply do not want to lose too many near-MLB caliber guys early in the season so it is normal that a few guys start a level lower than many think that they should. But it's mostly about getting the work in. That all plays itself out with injuries and performance and there is the trickle down. But, with a guy with Balazovic's talent level, they're simply going to put him where they believe it is best for development. He's a little under the radar but he was sent to Arizona last fall so I'm surprised Jacob Pearson is still in CR. While familiar with names, reports, the handbook, etc, I will not play expert. But I see good and bad with this roster. There is some potential at catcher. That's a good thing! We've gone from nothing to some actual depth in the system for the future. But a guy I am curious about is Chris Williams. He was drafted as a senior and signed for next to nothing. But he WAS a catcher before injury prevented him from playing that his senior year. He has a powerful bat with swing and miss. Can he still catch? Or is he really just a bat? Really excited to see what Severino does his second season. Really disappointed in the 2018 that Cabbage and Bechtold had. There seems to be so much to like in both of them, but I would have expected both of them to be ready for Ft Myers this year, despite a roster crunch. Older, a college draftee, and such a solid first season, I may be more disappointed in Bechtold. Like the athleticism and potential of this OF! Especially Celestino and Keirsey. I think the pitchers are where they should be. Enlow and Balazovic are ready to explode, Graterol-like. But they are still so young, I think they are where they should be for now. Maybe I'm just the eternal optimist, but I think the whole roster gets better when Javier joins them! Can't wait for a summer trek to CR to see him and this team! What was he sent to Arizona for last fall? Pearson was called up to Cedar Rapids on Memorial Day weekend last year, so no surprise he's sticking with the Kernels to start. He got quite a bit of playing time with the big league club this spring too. Solid player, a good prospect. I can only say this at this time, so take it for what it's worth and I'll see what more I can find out. When I was in Ft. Myers (admittedly just a week), I did see Chris Williams with catcher's gear on once or twice that week, but mostly at 1B. Same with Michael Davis (except mostly SS).